Citizens and some news sources are reporting that the island of St Martin/St Maarten is on the verge of a civil war as organized gangs armed with machetes raid stores and homes, leaving some residents in fear for their lives. The island, which remains isolated after widespread destruction caused by Hurricane Irma, remains cut off after the island’s main airport was significantly damaged. French news site Depeche reported that some residents have barred themselves inside their villas, fearing for their lives after gangs broke into a customs building and took weapons that were stored there. Residents say these gangs are smashing the doors of houses, shouting "outside the whites". Video footage of one resident went viral on Sunday after she hinted that there are more deaths than the media is reporting. She begged for residents to be evacuated from the violence and looting. "I’ve lived in St Martin for more than 20 years… No one fully realizes what’s going on right now - it’s the apocalypse here. The French government is doing nothing – they’re just going on TV, saying they are doing this or that but nothing is being done." "The police are not well trained…they haven’t lifted a finger to help us out of this mess. Stop showing us footage of destruction here – we know that already… come help us! We want to get out of St Martin! We cannot stay here! People are being killed! We pay our taxes and follow all the rules… Come get us! We cannot stay here! You have to evacuate the people that are here. We are part of France so get off your butts, stop talking rubbish on television – there are not 10 deaths, there are thousands of deaths! So get off your butts and come help us!" Last Friday Guadeloupe resident Morgane Lignières shared a social media post claiming that people were being attacked and that there was a shortage of food and water on the island of St Martin. 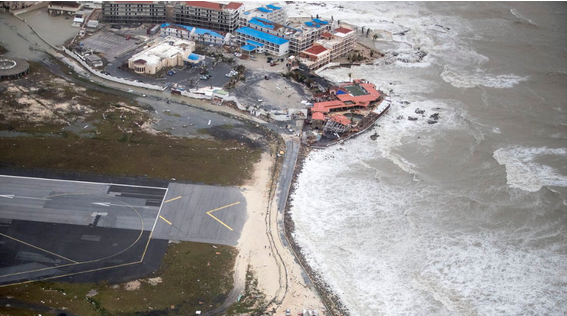 Meanwhile, on St Maarten, the Dutch side of the island, 1,200 people were evacuated so far and there have also been reports of looting and robberies. A report by NBC News said 1,200 Americans were airlifted off the island amid reports of violence and looting. The Dutch military also denied reports of a prison break on the island, which actually occurred on the British Virgin island of Tortola. Dutch Prime Minister Mark Rutte said in a media briefing that the “situation is serious” and that more armed forces have been deployed to restore order.